I’ve just been updating my Fraser page, as after further research I’m now sure I’ve pinned down the parents of my ggg grandfather, who was born in 1805. The Janet Sangster I identified as his mother most certainly was his mother. After researching where she lived after she married, and what become of the children she had with her husband William McWilliam, there are lots of overlap between her, her children and “my” William Fraser. It’s nice to know William grew up in a family household and, after he’d left home, was to remain in close contact with his mother and his half-siblings. 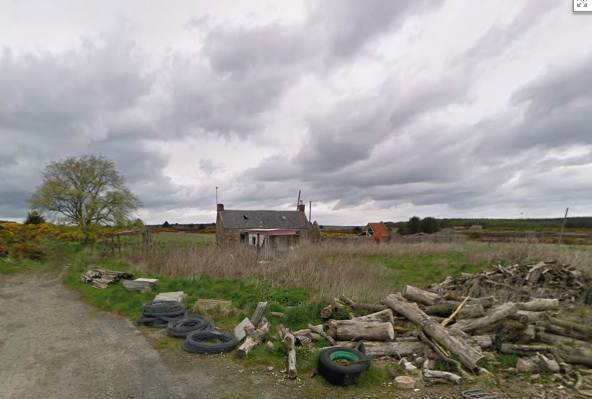 It looks as if the McWilliam family lived on a croft at Nether Kinmundy, which although in the parish of Longside is just a few fields away from Mosside, where William Fraser leased the croft that was to be the Fraser family home until the late 1940s. The moral of the story is that if you have what you think of as a brick wall, keep revisiting it, keep researching, and one day just one little clue might make you think a little bit differently, and down the wall tumbles. I still need a bit more evidence, though, before I can say for sure that wounded at Waterloo William Fraser was the father. I decided it was time to spend some money downloading the actual OPR pages from ScotlandsPeople for some of my early Fraser ancestors rather than going just from FamilySearch entries. And I hit lucky with my very first download. For whatever reason, a lot of the Cruden OPR looks like a copy, as it’s all in the same hand writing and is not in date order. The order of the baptisms listed on the one page I downloaded are 1828, 1854, 1849, 1852, 1845, 1853 and 1830. My suspicion is that when official registration began in 1855, someone decided to produce a copy of the Cruden OPR that wasn’t in chronological order. I’d love to know why, but I have to be grateful it was done as the result is that just one page contains three baptisms that are of my ancestors – so I got three for the price of one. This is the baptism of my GG Aunt Isabella Fraser in 1828, which gives a good deal of detail for an OPR. But on the same page I found two more relevant baptisms. This is the baptism for my GG Uncle William Fraser in 1830, again with some very useful detail. And finally, this is the baptism for the illegitimate daughter of my GG Aunt Janet Fraser with Thomas Matthew. This one has left me intrigued to know who the witness Robert Fraser was, as so far there is no Robert Fraser on my family tree so I don’t know how he was connected. A good clue to follow up, though. It’s snowing again, so I have a good excuse to stay in and do some research. I decided it was time to have a really good look at who my GGG Grandfather William Fraser was, and in particular who his parents were. I already knew he was the illegitimate son of Janet Sangster, from Brunthill croft near Hatton, Aberdeenshire, who, from the baptism entry for her son William, was most likely to have been a daughter of John Sangster. So thanks to FamilySearch, Ancestry and ScotlandsPeople, I’ve narrowed down the possibilities and think I’ve worked it out. But as the records are thin on the ground it can only be the most likely possibility. I can’t say it’s certain. It does all fit, though. So the bit about GGG Grandfather William Fraser has now been edited on the Fraser page here, and hopefully there will be more to write about the Fraser/Sangster line going back into the 1700s. This is a photo of my grandparents, Clara Green of Kirkstall, Leeds and James Fraser of Mosside croft, Hatton, Aberdeenshire. It was taken to mark their marriage in 1919 in Kirkstall, and Clara is making sure her wedding ring is on display. 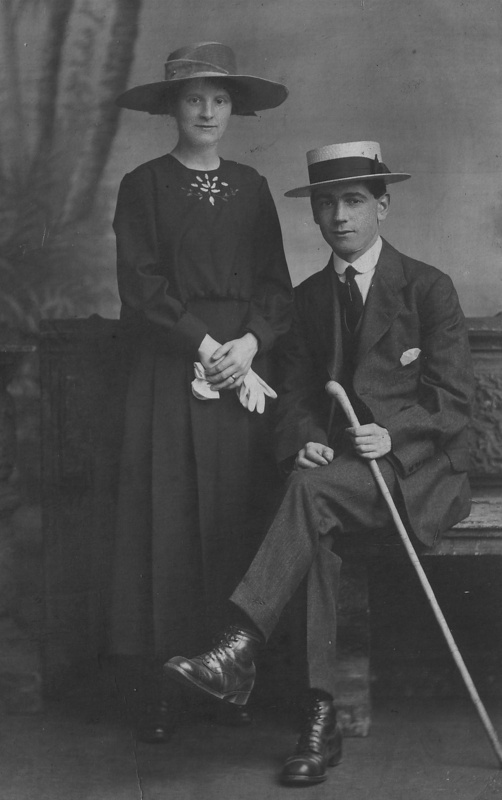 It was obviously taken at a photographer’s studio, and I expect my grandfather’s hat and stick were the photographer’s props. This is a photo, that I took in 2000, of Mosside croft, near Hatton in Cruden parish, Aberdeenshire. It was the home of my Fraser ancestors from some time before 1841 until after the second world war. My mother spent some of her summer holidays there when she was young.The land extended to about 3 acres. The cottage had two rooms plus an attic, and there used to be a small dairy attached to it where my mother remembers her (step)grandmother making butter and cheese. The roofless building to the right of the cottage is the old steading, where the cows lived and vegetables and equipment were stored. At the back of the cottage was a pig sty. The lane on the left leads to the peat moss, where people from the surrounding area would come to dig their peats. The lane leads down to Hatton, which is a couple of miles or so south. A shame about the tyres! I don’t know who owns it now, but as it can be seen on Street View on Google Maps I do know it’s still derelict and the land is being used for storage.